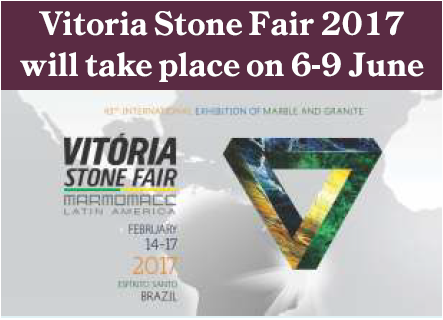 Considered one of the most important fairs in the ornamental stones sector in the Americas, the 43rd international marble and granite fair, Vitoria Stone Fair, Marmomac Latin America, came back to the fairs calendar this year and will take place between 6 and 9 June, 2017 in the Carapina Events Center, Serra. The event that would have happened in February, was canceled due to a strike in the Military Police which resulted in public security problems in the state of Espirito Santo. According to the Milanez & Milaneze CEO, Cecília Milanez Milaneze, activities for the fair are already underway. "Brazil is important in the worldwide scenario of natural stones and continues to be a reference point for foreign purchases. We have already started different international actions to bring buyers and expositors from the strategic markets to the Vitoria Stone Fair 2017, which will be take place in June. This week, our team will make a promotion in Xiamen Stone Fair, in China", she states. For the Sindirochas president, Tales Machado, the change of the date for the Vitoria Stone Fair this year was a result of an unusual situation. However, the Espirito Santo State stone sector is very well consolidated to continue as a protagonist of this activity in the country. "We think that temporary difficulties act as a stimulus because at the same time they bring opportunities as well. The Espirito Santo State stone industry is formed by businessmen with strong entrepreneur capacity, which for many years has made the State of Espirito Santo the biggest producer, trader and exporter of stones in Brazil. We are optimistic that the new event date will go beyond our expectations of a great event", he states. In order to reduce the cost of materials used in the construction sector, which is witnessing slow down for quite some time, Delhi Government has proposed to bring down VAT from 12.5% to 5% on granite, Swadeshi Kotah Stone, Dholpur Stone, Gwalior Stone and slate to bring it at par with tax rate for marble, which was brought down last year in the budget for the year 2017-18 presented in the Delhi State Assembly on 18th March, 2017. Thus, almost all the varieties of stones used for flooring and wall-cladding will have the reduced VAT of 5%. This would definitely give a boost to construction industry as the selling price of stones will come down and consumers will use stones in large quantity.